The high-profile race for Cook County State's Attorney comes as faith in the criminal justice system has been shaken not only in Chicago, but also in cities across the nation. The Democratic candidates running for the office joined us in their final appearance together before Tuesday's primary. Kim Foxx, a former assistant state's attorney who also once served as chief of staff to Cook County Board President Toni Preckwinkle. Incumbent Anita Alvarez, who was first elected Cook County State's Attorney in 2008. Prior to that, she was a prosecutor in that office for more than 20 years. Donna More, a former federal and county prosecutor. She also served as chief legal counsel to the Illinios Gaming Board. More is currently a managing partner at the law firm Fox Rothschild. The handling by incumbent State’s Attorney Anita Alvarez of the Laquan McDonald shooting case has been a key point in the campaign, with critics questioning why it took 400 days for charges against Chicago police Officer Jason Van Dyke to be filed. Alvarez started a joint investigation of the case with the FBI and U.S. Attorney in November 2014. “Normally, when you do a joint investigation, you wrap it up together,” she said. “I anticipated that this case would be wrapped up in the middle of December of last year, and when I was informed that the video was going to be released, I knew that what I had to do for public safety reasons, to make sure that we didn't see any violence in the city because – when I saw that video for the first time ... I was shocked just as anyone else. So, doing a meticulous, thorough investigation is what we did, and the whole goal was to seek justice for Laquan. Challengers Kim Foxx and Donna More disagreed. “To be clear, only the Cook County State's Attorney could have brought murder charges,” Foxx said. “What she said at the time, where she announced the charges, was that she had been waiting – she knew for weeks that she was going to charge Officer Van Dyke – but she held off on those charges because she was waiting for the feds to finish their investigation, which is completely unrelated to the murder charges. “Nobody in this county believes that charges would have been filed if the video tape hadn't been released,” said More. “Officer Van Dyke would still be on the street, because in every high-profile case, this office has never charged a police officer and certainly not timely. Questions have been raised over Foxx’s trial experience. As first reported by the Chicago Sun-Times’ Dan Mihalopoulos, public records provided to the newspaper by Alvarez’s office showed Foxx worked on only one felony case that went to trial. Foxx claims Alvarez’s tally is incorrect and that she has worked on “about 100” cases that went to trial during her time at the state’s attorney’s office. More has been criticized for never having tried a criminal case in a courtroom in 25 years. But she said that does not put her at a deficit. All three candidates offered similar responses to the question of what would be an appropriate timeline for releasing videos of police shootings. Mayor Rahm Emanuel plans to release such videos within 60 to 90 days. “I don’t know if there’s an arbitrary number that you can put on the date that you release the video … where it doesn’t compromise the integrity of your investigation,” Foxx said. Foxx’s campaign has been fined over $19,000 in a unanimous ruling by the Illinois State Board of Elections for multiple violations of campaign finance laws. Foxx failed to disclose that Cook County Board President Toni Preckwinkle paid for a $25,000 poll last year to gauge Foxx’s candidacy and committed other infractions. The Foxx campaign argues that she did not have to disclose the in-kind donation because she had not made a decision on whether to run yet. “We disagree, we’re appealing and we will follow the recommendations that were made by the State Board of Elections,” Foxx said. Foxx, Alvarez and More participated in a post-forum press conference at WTTW. Watch the video below. Co-sponsors of the Cook County State's Attorney candidate forum We thank the members and guests of the Cook County League of Women Voters who comprised our live audience during the forum. Meet the candidates running for the office of Cook County State's Attorney as part of WTTW’s 2016 Voters’ Guide to the Primary. Nov. 17, 2015: Kimberly Foxx, former chief of staff to Cook County President Toni Preckwinkle, speaks with us about her campaign and vision for the office. 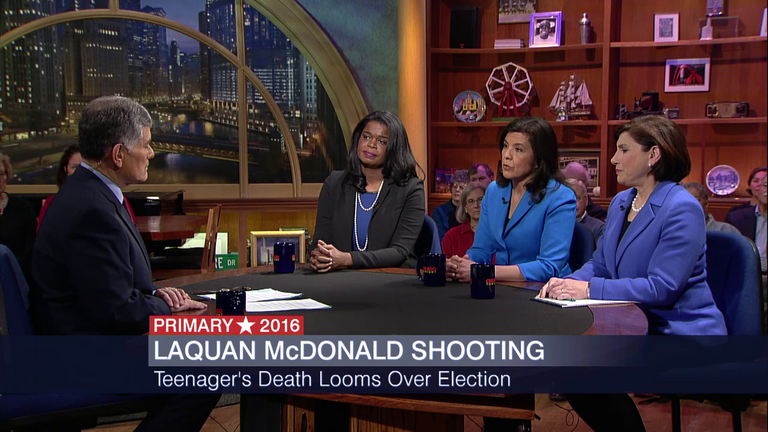 Dec. 1, 2015: We talk with State’s Attorney Anita Alvarez about the Laquan McDonald investigation and why she thinks voters should give her another four years in office. Dec. 2, 2015: As Alvarez fends off calls for her resignation in the wake of the Laquan McDonald shooting and subsequent criticism over the pace of the investigation, we ask former state and federal prosecutor Donna More what she might have done differently.